A Mesch - Sensor combines with a sensor that automatically detects labels of different stroke to eliminate the need for manual alignment when you load labels. - For pre- printed general roll labels, No special ( punched or slit ) labels or separators required. - Supports use of label size from 18 x 20 mm up to 60 x 100 mm. * For pre- printed general roll labels, No special ( punched or slit ) labels or separators required. * Supports use of label size from 18 x 20 mm up to 60 x 100 mm. Since 1995, Barscan Systems & Ribbons Pvt. Ltd. is working as a trustworthy Distributor, Supplier, Trader of Label Applicator and Label Dispenser. 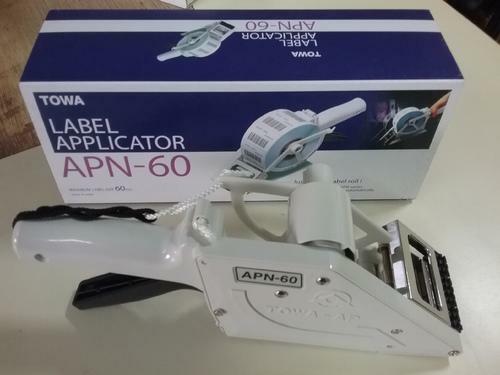 The range we offer includes Hand Label Applicator, Tagging Gun and Automatic Label Dispenser. Our products are offered to the clients after properly quality checks prior final dispatch to make sure their abidance with industry laid norms. Superior quality, fine finishing, longer life and easy operations make our products widely acknowledged by the patrons. Moreover, we are leading traders of brands like Citizen, Towa, Godex, Argox, Zebra and Motorola. Furthermore, our competitively priced Barcode Printer Repair Services and ability to fulfill emergent of bulk orders within the specified time has enabled us to serve huge clientele. Since our incorporation, we are focused towards serving our clients with most beneficial & cost effective solutions. We have been affiliated with the reckoned vendors of the market, who are efficient enough to meet the bulk & urgent orders of the patrons within the specified time schedule. Our work force conducts market research time to time so as to keep pace with the latest market development, upcoming technologies and changing demands of the buyers. We always examine products on the basis of well-defined parameters of quality, so that, they can assure perfect performance. In addition to this, we have a spacious and large warehousing unit that helps us to keep our offered range under the safe and secure environment.